Aquaman is my second favourite comic character, so when I started the New-52 series, I was delighted by just how well done and seriously they were taking the character. The first issue of this run spent a short amount of time dispelling the negative perceptions of Aquaman in popular culture before moving on to tell compelling stories of a man with his foot in two worlds and the responsibilities that come with being a king. 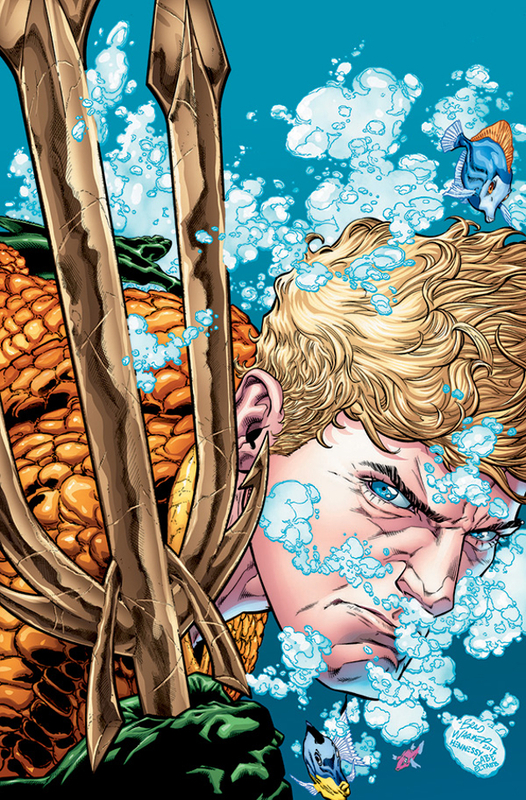 Aquaman Rebirth attempts to accomplish the same thing, but therein lies its major problem. The story follows Aquaman as he attempts to stop an Atlantean terror cell from destroying a major coastal city with powerful bombs. Assisting Aquaman is Mera, his soon-to-be-wife, as well as the other members of his new Atlantean embassy in America as he attempts to bridge the gap between land and sea. As these events are taking place, we have text boxes from the perspective of an unknown person explaining the history of Aquaman and how the world views him. This is where my main problem with this book emerges; almost all of the text of the issue is given to us as exposition. It does a serviceable job of introducing the character and showing where the series intends to go, but is so dry as to make reading it a chore, compounded by the continual comments about how people view Aquaman as “lame” when he is actually not. The action in the issue does enough to show us this fact that repeating it several times just makes it sound as though the book is trying too hard to prove itself to people, as opposed to letting people see the virtue of the character for themselves. The artwork is superb, showing great kinetic action and a very detailed world. Aquaman's redesigned costume, based on pebbles now instead of scales, is also surprisingly well done. It is a minor departure from the New-52 costume that would hardly be noticeable without looking for it, and retains the iconic look of the character. The Atlanteans are appropriately stylized and the influences of a sub-aquatic civilization remain obvious to the glance. My one minor issue is that on occasion, some of the faces come off as a bit peculiar, particularly when viewed partially from the side, although this is only noticeable a couple of times in the issue. Ultimately, Aquaman Rebirth has left me unfortunately underwhelmed in an issue that I was very much looking forward to. There is nothing aggressively bad about the issue, it's just one major exposition dump for new readers that feels like it lacks a lot of the heart that the series usually has. It does, however, set up the story for future issues well, and gives us a better view into the mind of a classic Aquaman character, the one ultimately narrating the book. I look forward to where the series itself will go from here, and believe that the problems of this issue are likely a one-time thing, making me confident that the series itself will definitely be worth checking out.